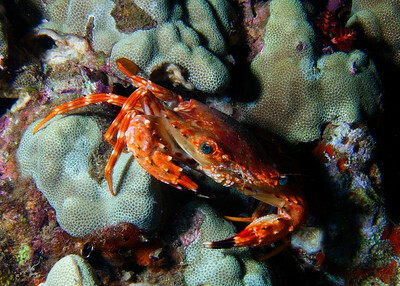 We've got some unusual crustaceans in Hawaiian waters--Anemone crabs and sponge crabs are fairly common on our night dives. 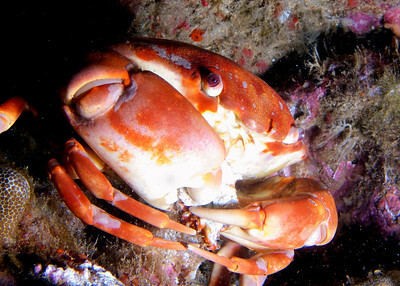 Very difficult to ID a crab this small! 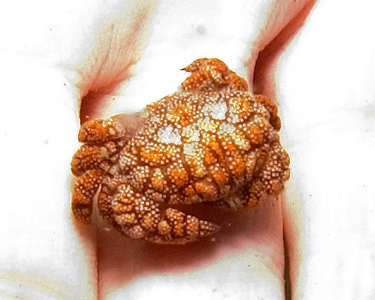 I believe it's a Showy xanthid crab (Pseudoliomera speciosa), and as you can see it's just a little wider than my finger. 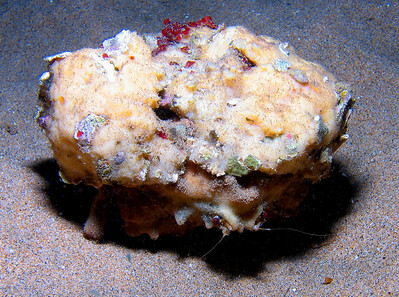 A Shaggy sponge crab (Cryptodromyopsis plumosa). 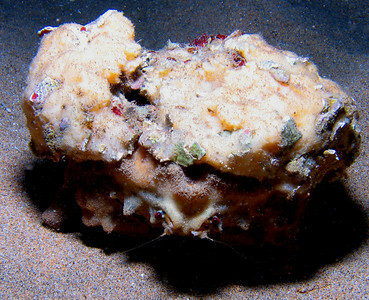 Unlike the Sleepy sponge crab (see other photo in this gallery) the Shaggy sponge crab hollows out a custom-tailored sponge hat for itself, and can hide under it completely. 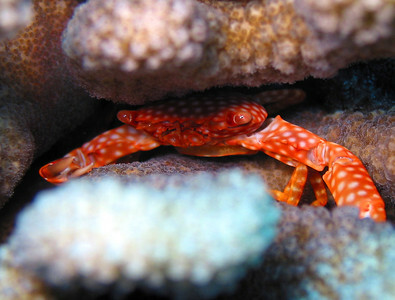 Yellow-spotted guard crab (Trapezia flavopunctata) preparing to defend its home. 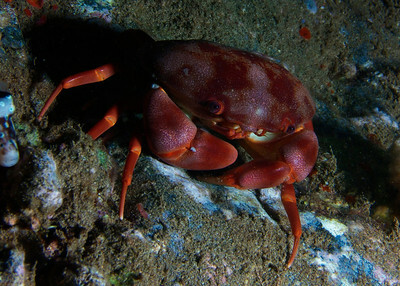 A Hawaiian swimming crab (Charybdis hawaiensis)--easy to ID these crabs, take a look at the odd, vertically striped eyes! 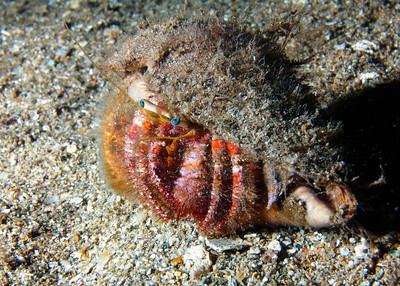 A Bloody hermit crab (Dardanus sanguinocarpus) inhabiting the shell of what I think is a small Leopard cone--hard to tell with all the overgrowth. 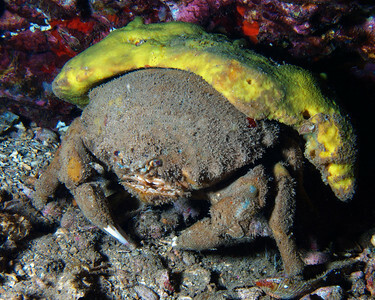 A big Sleepy sponge crab (Dromia dormia), showing the large protective yellow sponge it carries around for camoflauge and protection, which gives D. dormia it's family common name. 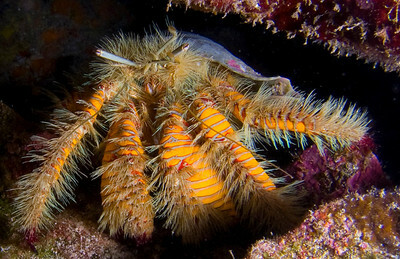 Hairy yellow hermit crab (Aniculus maximus), one of the largest Hermits in the world. 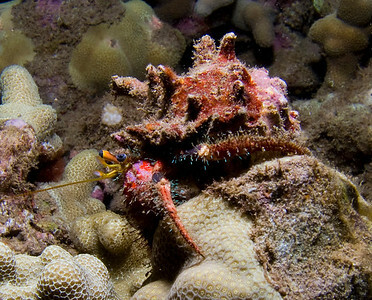 It may not be obvious from this photo, but that's a Triton's Trumpet shell...this crab is about the size of a softball. 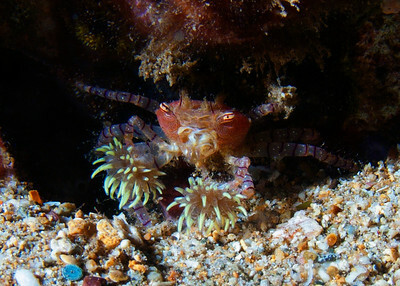 A young Jeweled anemone crab (Dardanus gemmatus)--with some very healthy symbiotes on its shell! 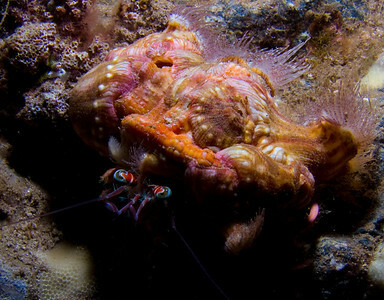 The symbiotes are Hermit crab anemones (Calliactis polypus), and I think outweigh the host animal in this case! 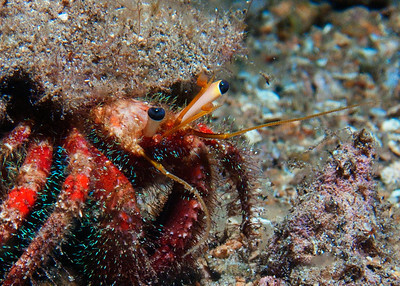 The small anemones on either side of the crab's eyes are a different, and as yet undescribed species. No, the photo is not upside down! 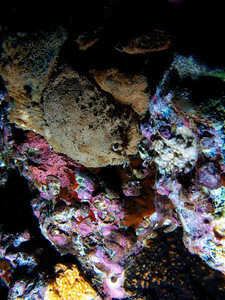 I spotted this Sleepy sponge crab (Dromia dormia) clinging to the underside of a ledge...that shaggy part to the back of the crab is a sponge it holds on to for camouflage and protection. 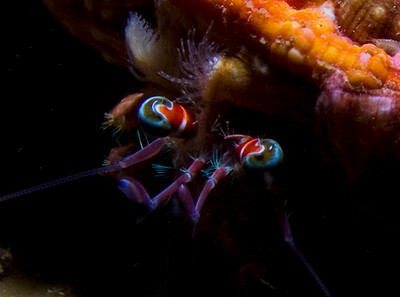 Bloody hermit crab (Dardanus sanguinocarpus), macro detail. 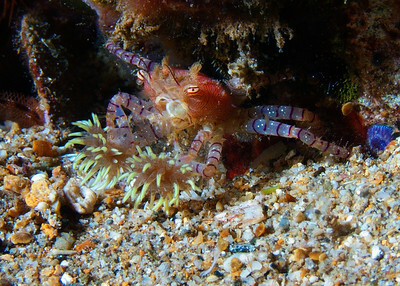 One of the odder crustaceans you'll see in Maui waters...was thrilled last night to have my very first sighting of a Hawaiian pom-pom crab (Lybia edmondsoni). 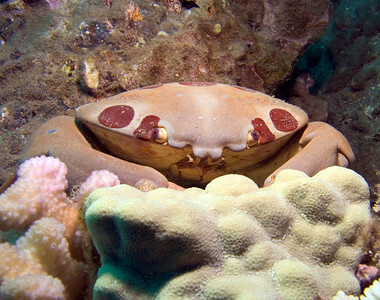 This amazing crab keeps a stinging anemone at the end of each claw for defense and hunting, giving it its common name, as well as an unusual appearance. 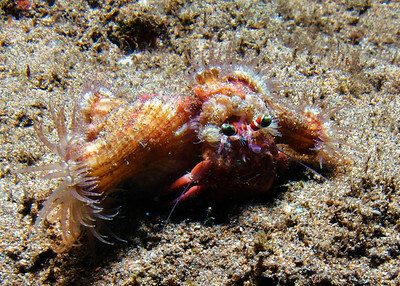 Another look at L. edmondsoni brandishing its anemones...yet another amazing creature that's only found in Hawaii! 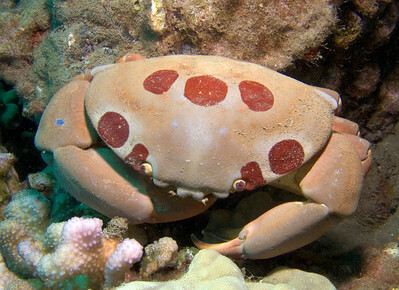 A rare sight at scuba depths, this is a full grown Blood-spotted swimming crab (Portunus sanguinolentus). 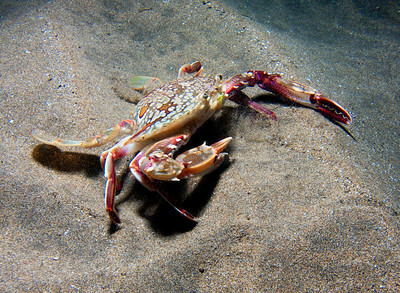 The spread of those claws is about 16"...I kept my distance.